NuGeneration Limited (NuGen) plans to build a nuclear power station of up to 3.8GW* gross capacity at Moorside, close to Sellafield, in West Cumbria. To facilitate the Moorside project, NuGen is undertaking a programme of works and studies to provide information on the Moorside site’s characteristics. The objectives are to carry out a geotechnical and geophysical campaign, providing sufficient geological and geotechnical information to inform the detailed design of foundations and ancillary structures and to determine tunnel alignments. Moorside is one of the largest UK site investigations to be let as a single package. 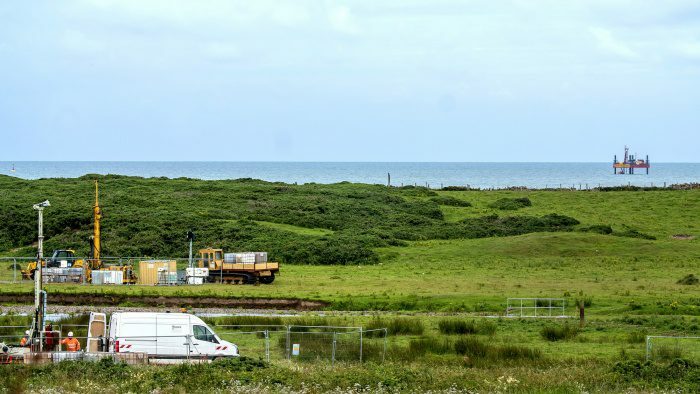 Under the contract, Fugro is carrying out onshore and offshore site characterisation involving geotechnical, hydrological, topographical, geophysical and geo-environmental data acquisition. In addition to informing the design and layout of the Moorside site, data will support licensing, planning applications and other consents for the construction of the nuclear power station. Work started in early December 2015 on the nearshore phase of the Moorside site characterisation for NuGen. The initial phase of works comprised bathymetry surveys utilising Fugro’s geophysical vessels Fugro Seeker and the RV Valkyrie. In early 2016 the Fugro Seeker returned to site to complete the survey and also undertake preparatory UXO clearance surveys for geotechnical borehole locations and seismic refraction lines. In April 2016 the Fugro jack-up barge Aran 250 joined the project to undertake 11 geotechnical boreholes, involving cable percussion boring, rotary drilling and an extensive in situ testing programme. The vessel Bravo Topaz was mobilised in April and successfully completed a deep seismic reflection survey ahead of schedule. Further work included bathymetric surveys from the Fugro vessel RV Discovery, and shallow seismic reflection and refraction surveys from the Fugro Seeker. In addition to offshore activities, Fugro has undertaken a significant onshore drilling programme for Moorside which has utilised up to 18 rigs to drill 300 boreholes. Cable percussive and rotary coring techniques have been predominantly used, as well as wireline drilling, for comprehensive investigations and analysis of ground engineering and hydrogeological data. These include in situ testing of hydrofracture properties, high pressure in situ dilatometer testing, packer testing, and pump testing to determine hydraulic permeability. Fugro carried out rotary coring to depths up to 220 metres for the extraction of class I rock samples and large diameter rotary drilling for boreholes to truth the seismic geophysics and faulting analysis. To reduce spoil, sonic drilling techniques have been employed to drill large diameter boreholes for the installation of pumping wells and to facilitate deep geophysical wireline logging. Additionally, some boreholes from the geotechnical programme have been reused to support 2D seismic reflection surveys. Fugro will present data from the land-based and marine seismic surveys to provide a continuous, land-to-sea profile through the shallow transition zone (intertidal area) to help the design and construction of new infrastructure. Fugro’s data management system ‘Fugro Online’ is being used to facilitate the exchange of data and the QA/QC process between NuGen and Fugro throughout the project. The site team has also undertaking trial pitting and in situ testing to determine viable locations for the storage of excavated spoil, which will be reused for landscaping. The land-based site characterisation will be supplemented by drilling and groundwater monitoring to support radiological screening undertaken by Amec Foster Wheeler. As part of the contract, Fugro is implementing its largest programme to date of sample testing and analysis in the UK. The global group is drawing on its significant advanced laboratory resources to process the huge volume of tests to a fast-track six-month schedule. Fugro specialists from many different countries and offices have participated in the project. Fugro is due to complete the bulk of the site characterisation before the end of the year.